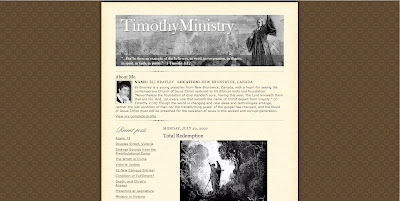 Timothy Ministry: TimothyMinistry.com - Two Year Anniversary! I remember last years post. Praies God dear brother. I thank Him I was able to be in the same room when you made last years and this years - Glory to God. I remember when I came on here 2 years ago and read some articles and was pleasantly surprised. Keep doing the will of Him that has called you.